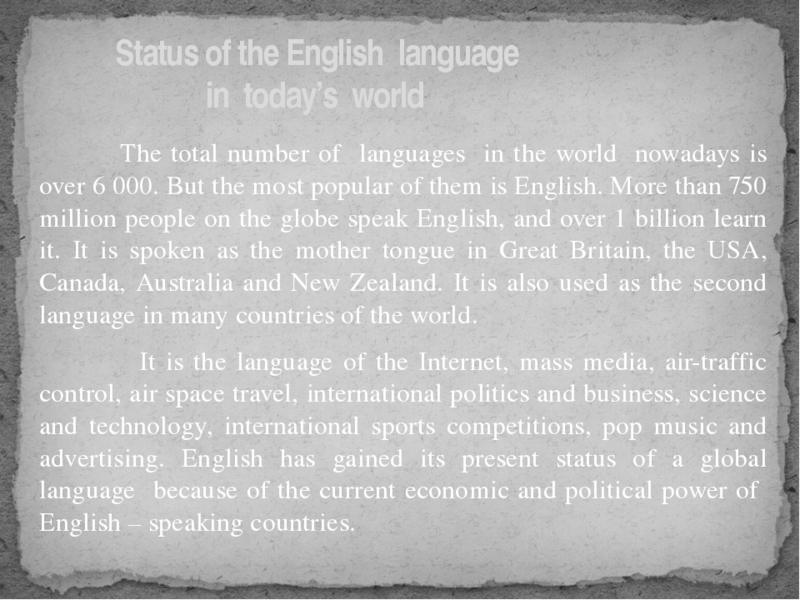 Главная / Иностранные языки / Презентация "Some historical facts about Great Britain and development of the English language"
Презентация "Some historical facts about Great Britain and development of the English language"
How did the English history start? About 3 thousand years BC people from the north of Spain (the Iberian Peninsula) came to many parts of Europe, including the British Isles. So, those people who lived on the territory of Great Britain in the earliest times were of the Iberian origin (иберийцы). 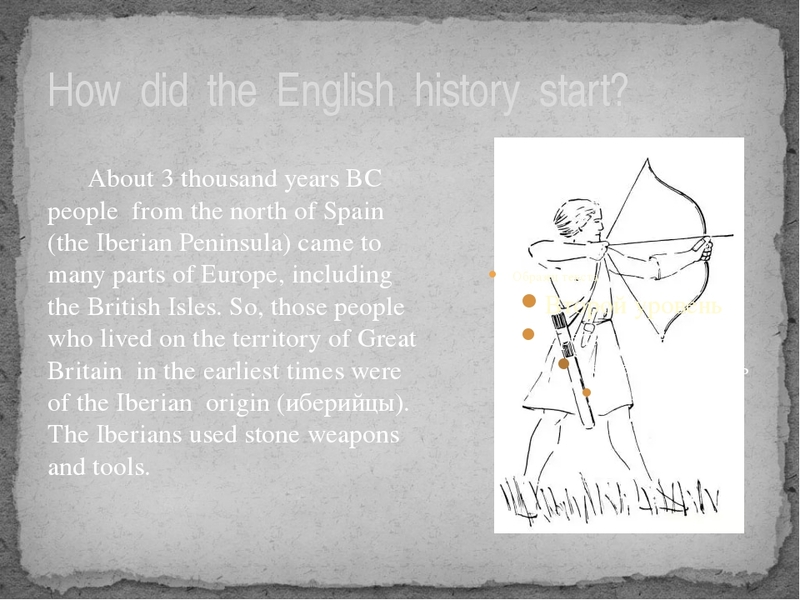 The Iberians used stone weapons and tools. 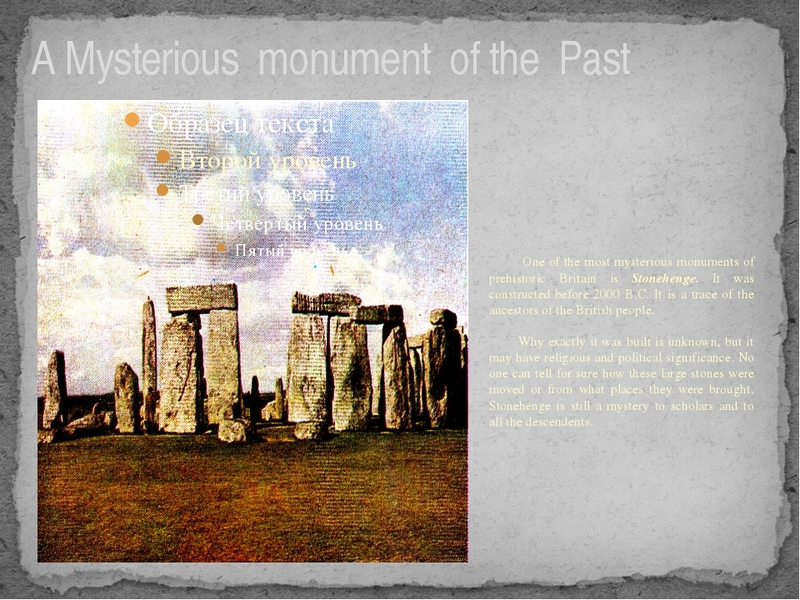 A Mysterious monument of the Past One of the most mysterious monuments of prehistoric Britain is Stonehenge. It was constructed before 2000 B.C. It is a trace of the ancestors of the British people. Why exactly it was built is unknown, but it may have religious and political significance. No one can tell for sure how these large stones were moved or from what places they were brought. Stonehenge is still a mystery to scholars and to all the descendents. 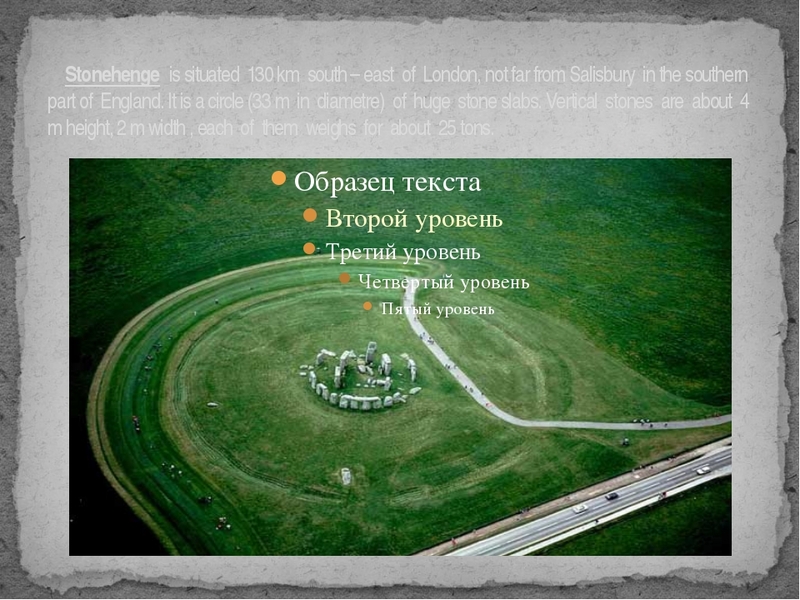 Stonehenge is situated 130 km south – east of London, not far from Salisbury in the southern part of England. It is a circle (33 m in diametre) of huge stone slabs. Vertical stones are about 4 m height, 2 m width , each of them weighs for about 25 tons. The Tribes of Celts In the 7-th century BC the Iberians faced a great problem because the British Isles were invaded by the Celts (кельты). These tribes may have come from the eastern and central Europe. Each tribe of Celtic people was ruled by its own king or queen. The priests, called druids, were important members of them. Druids preserved all religious teachings, tribal laws, history, medicine and natural philosophy. 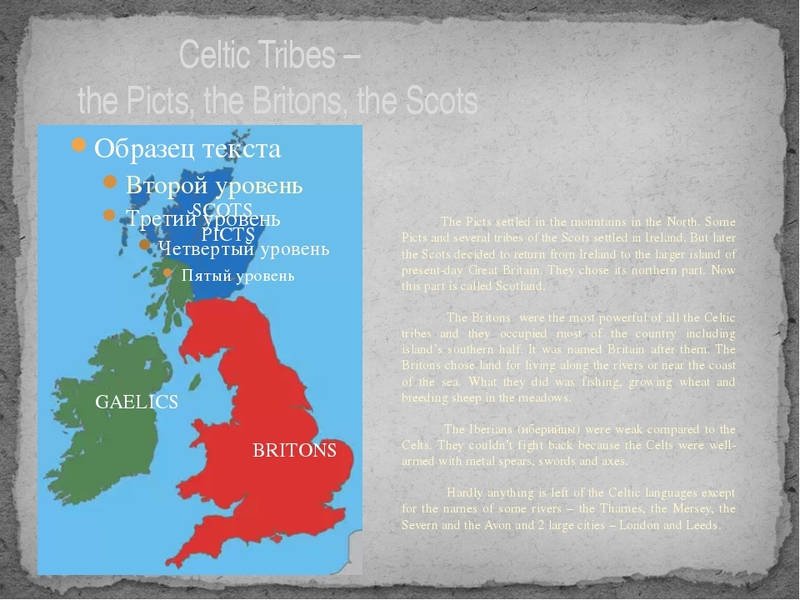 Celtic tribes were represented by the Picts (пикты) , the Scots (скотты) and the Britons (бритты). 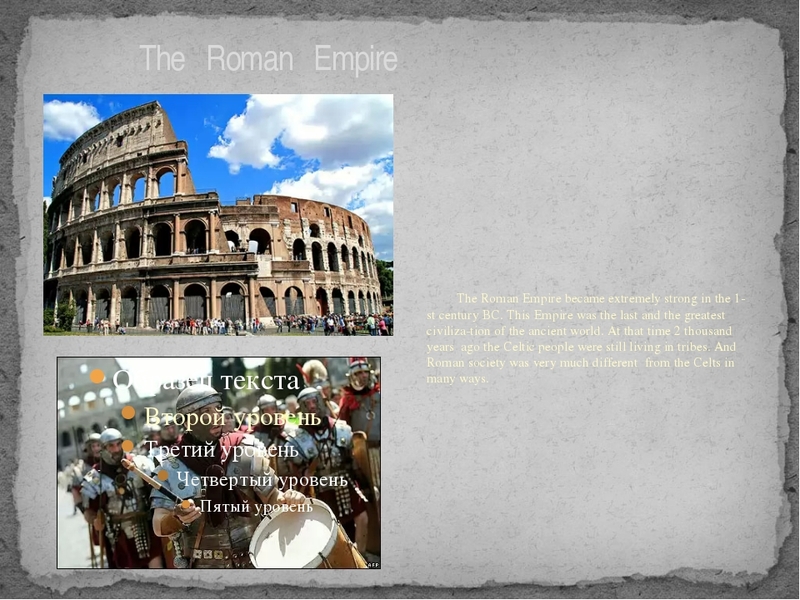 The Roman Empire The Roman Empire became extremely strong in the 1-st century BC. This Empire was the last and the greatest civiliza-tion of the ancient world. 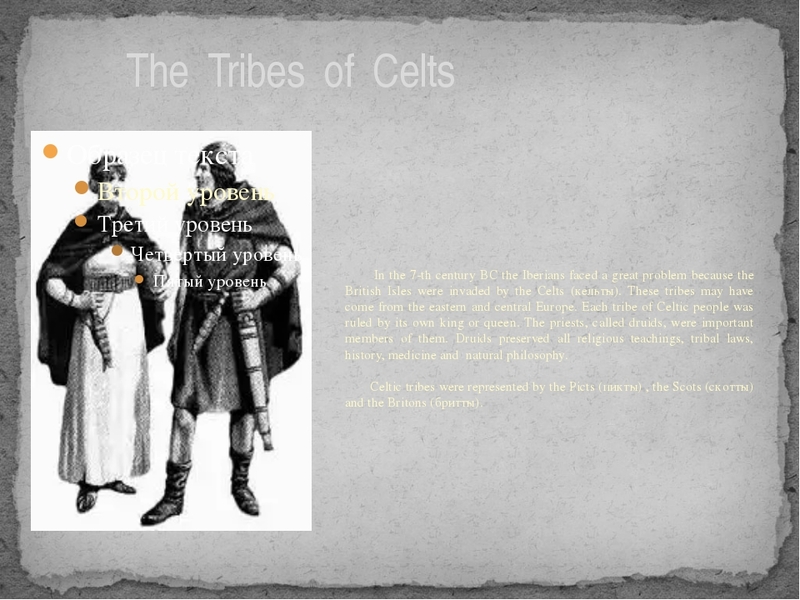 At that time 2 thousand years ago the Celtic people were still living in tribes. And Roman society was very much different from the Celts in many ways. 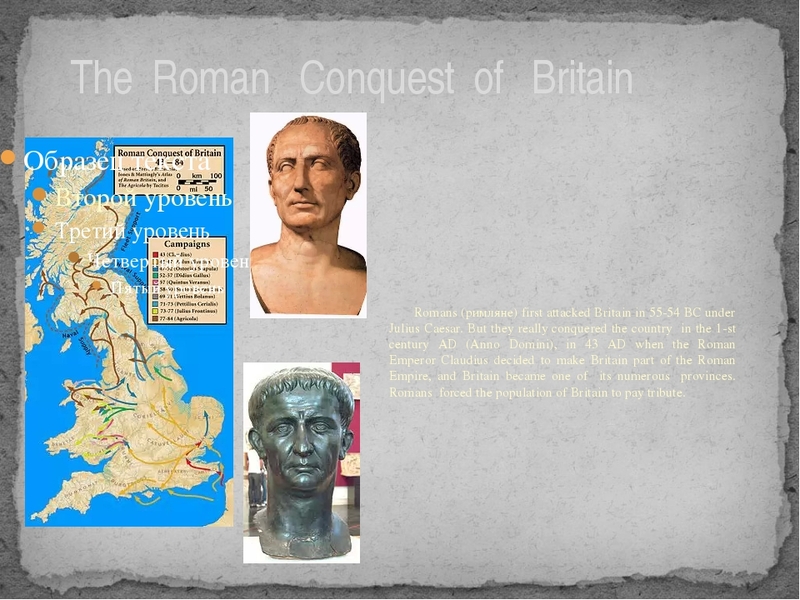 The Roman Conquest of Britain Romans (римляне) first attacked Britain in 55-54 BC under Julius Caesar. But they really conquered the country in the 1-st century AD (Anno Domini), in 43 AD when the Roman Emperor Claudius decided to make Britain part of the Roman Empire, and Britain became one of its numerous provinces. Romans forced the population of Britain to pay tribute. 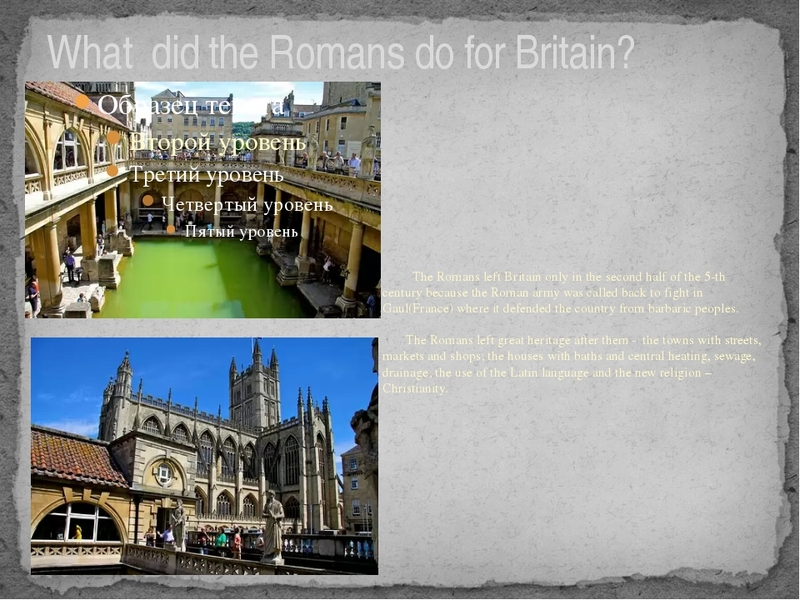 What did the Romans do for Britain? The Romans left Britain only in the second half of the 5-th century because the Roman army was called back to fight in Gaul(France) where it defended the country from barbaric peoples. The Romans left great heritage after them - the towns with streets, markets and shops; the houses with baths and central heating, sewage, drainage; the use of the Latin language and the new religion – Christianity. 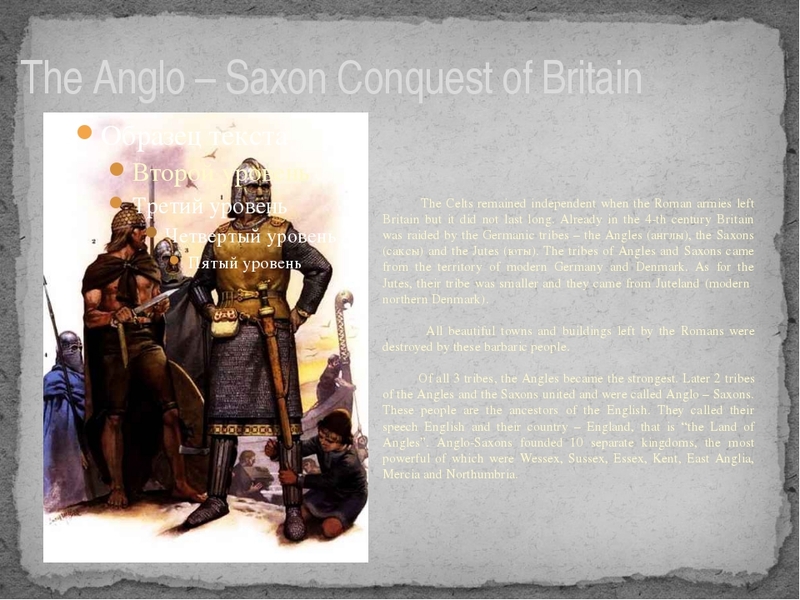 The Anglo – Saxon Conquest of Britain The Celts remained independent when the Roman armies left Britain but it did not last long. Already in the 4-th century Britain was raided by the Germanic tribes – the Angles (англы), the Saxons (саксы) and the Jutes (юты). The tribes of Angles and Saxons came from the territory of modern Germany and Denmark. As for the Jutes, their tribe was smaller and they came from Juteland (modern northern Denmark). All beautiful towns and buildings left by the Romans were destroyed by these barbaric people. Of all 3 tribes, the Angles became the strongest. 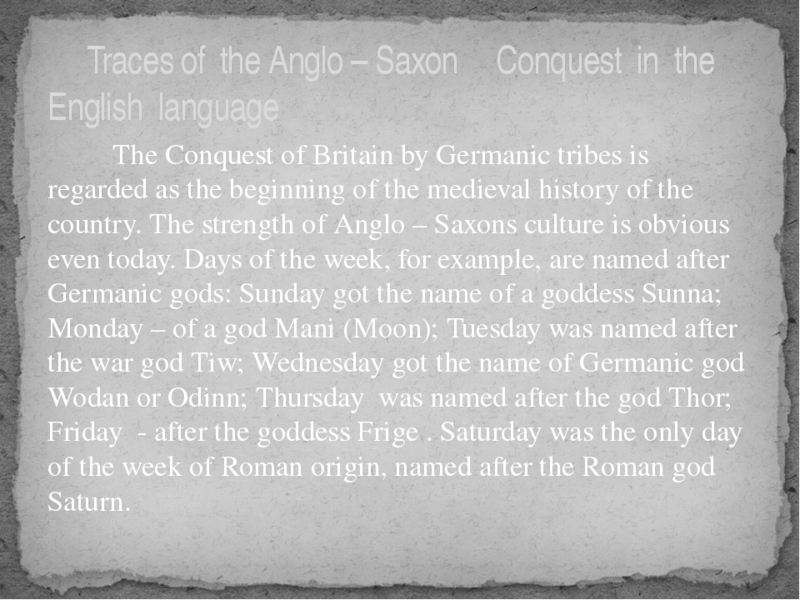 Later 2 tribes of the Angles and the Saxons united and were called Anglo – Saxons. These people are the ancestors of the English. They called their speech English and their country – England, that is “the Land of Angles”. Anglo-Saxons founded 10 separate kingdoms, the most powerful of which were Wessex, Sussex, Essex, Kent, East Anglia, Mercia and Northumbria. 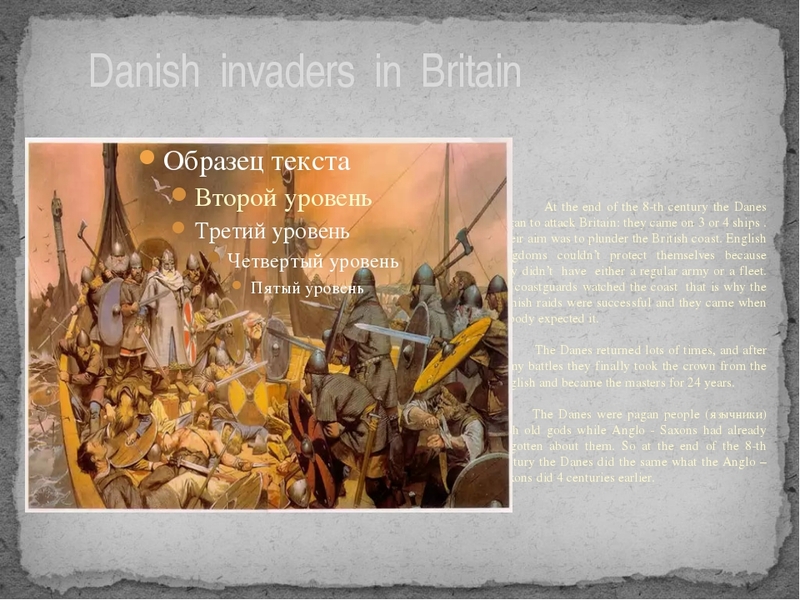 Danish invaders in Britain At the end of the 8-th century the Danes began to attack Britain: they came on 3 or 4 ships . Their aim was to plunder the British coast. English kingdoms couldn’t protect themselves because they didn’t have either a regular army or a fleet. No coastguards watched the coast that is why the Danish raids were successful and they came when nobody expected it. The Danes returned lots of times, and after many battles they finally took the crown from the English and became the masters for 24 years. 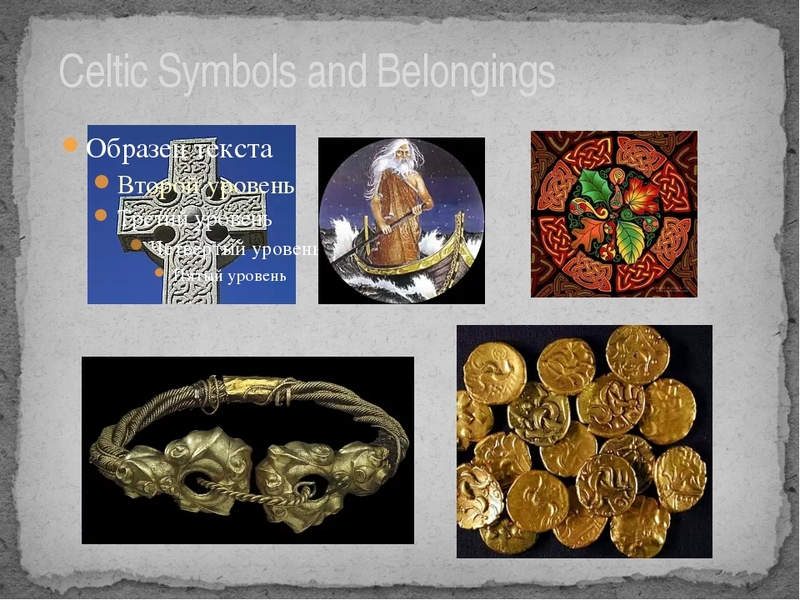 The Danes were pagan people (язычники) with old gods while Anglo - Saxons had already forgotten about them. So at the end of the 8-th century the Danes did the same what the Anglo – Saxons did 4 centuries earlier. 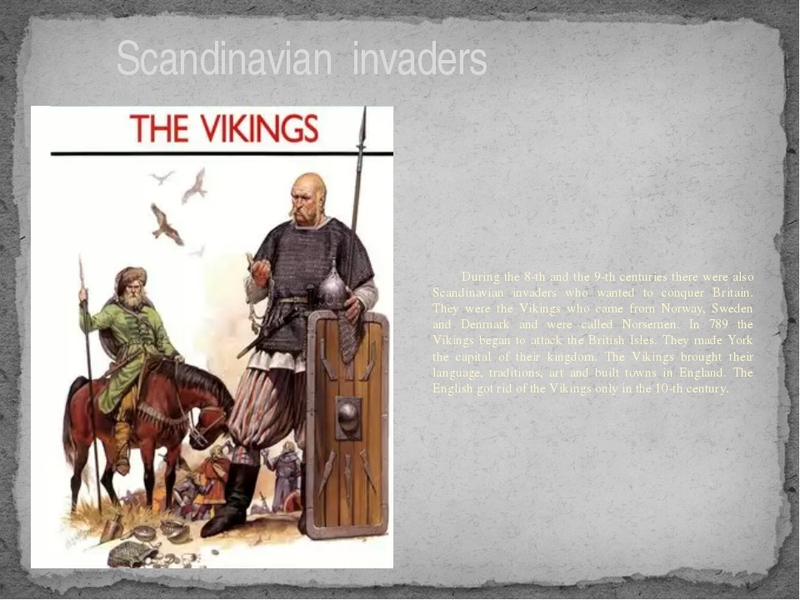 Scandinavian invaders During the 8-th and the 9-th centuries there were also Scandinavian invaders who wanted to conquer Britain. They were the Vikings who came from Norway, Sweden and Denmark and were called Norsemen. 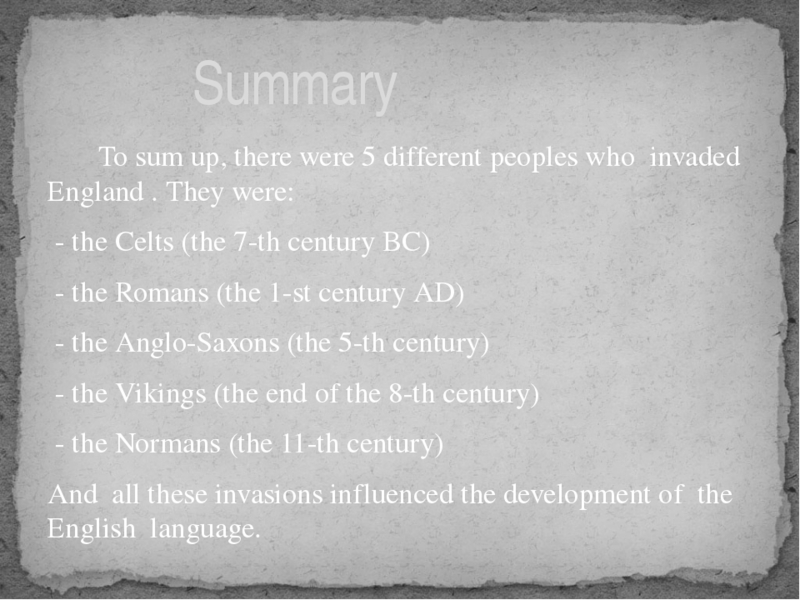 In 789 the Vikings began to attack the British Isles. They made York the capital of their kingdom. The Vikings brought their language, traditions, art and built towns in England. The English got rid of the Vikings only in the 10-th century. 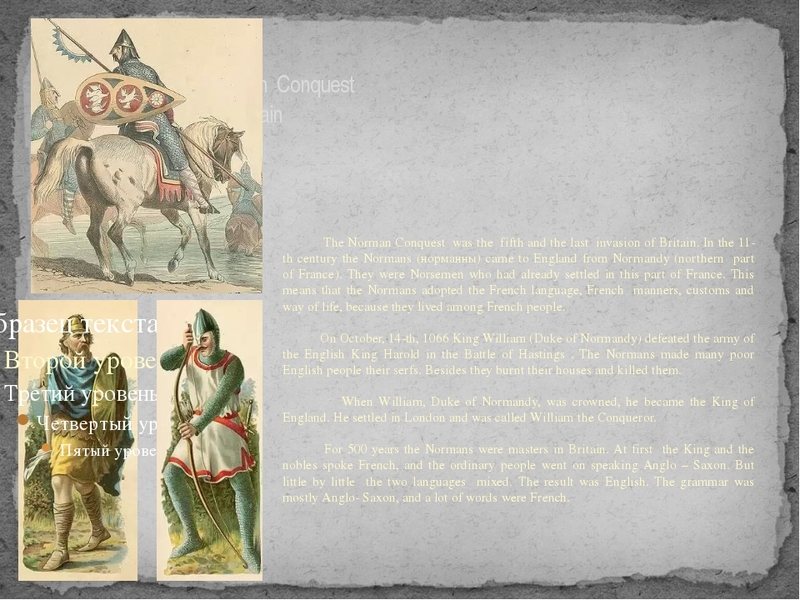 The Norman Conquest of Britain The Norman Conquest was the fifth and the last invasion of Britain. In the 11-th century the Normans (норманны) came to England from Normandy (northern part of France). They were Norsemen who had already settled in this part of France. This means that the Normans adopted the French language, French manners, customs and way of life, because they lived among French people. On October, 14-th, 1066 King William (Duke of Normandy) defeated the army of the English King Harold in the Battle of Hastings . The Normans made many poor English people their serfs. Besides they burnt their houses and killed them. When William, Duke of Normandy, was crowned, he became the King of England. He settled in London and was called William the Conqueror. For 500 years the Normans were masters in Britain. At first the King and the nobles spoke French, and the ordinary people went on speaking Anglo – Saxon. But little by little the two languages mixed. The result was English. The grammar was mostly Anglo- Saxon, and a lot of words were French. 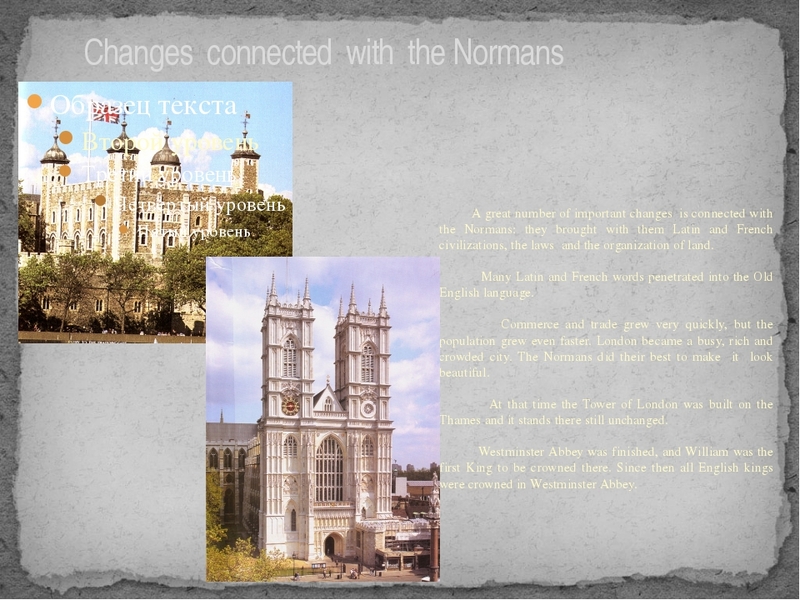 Changes connected with the Normans A great number of important changes is connected with the Normans: they brought with them Latin and French civilizations, the laws and the organization of land. Many Latin and French words penetrated into the Old English language. Commerce and trade grew very quickly, but the population grew even faster. London became a busy, rich and crowded city. The Normans did their best to make it look beautiful. At that time the Tower of London was built on the Thames and it stands there still unchanged. Westminster Abbey was finished, and William was the first King to be crowned there. Since then all English kings were crowned in Westminster Abbey. The Legend about Robin Hood One of the legendary heroes of those times was Robin Hood. He was a strong, tall, handsome man. The legend says that once the Normans came to his house : Robin’s father was killed in a fight, and the house was burnt down. Robin managed to save his life because he ran away into the forest of Sherwood. Many Saxons joined Robin Hood and made him their leader. Robin and his men were called the Merry Men by the poor people. 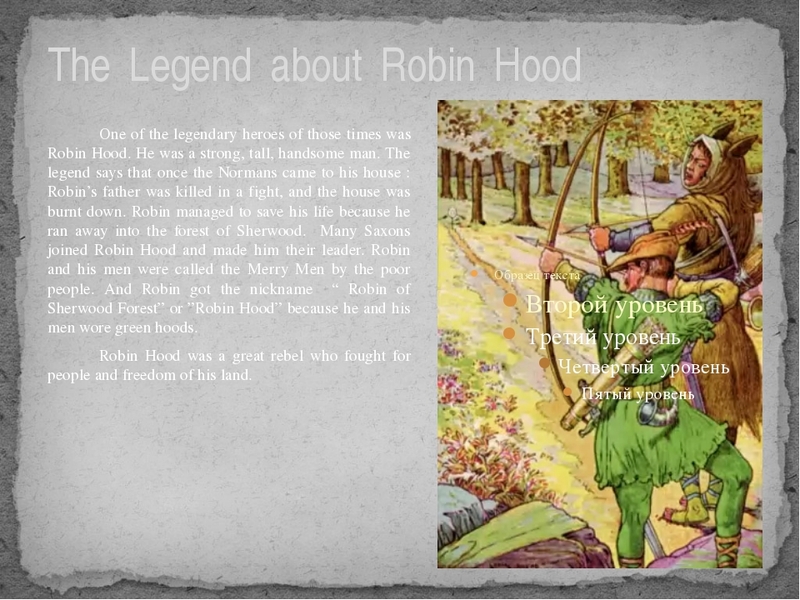 And Robin got the nickname “ Robin of Sherwood Forest” or ”Robin Hood” because he and his men wore green hoods. Robin Hood was a great rebel who fought for people and freedom of his land. Презентация "Some historical facts about Great Britain and development of the English language" предназначена для учащихся старшей ступени обучения и может быть использована на уроках английского языка в 9-11 классах и во внеклассной работе. Она содержит информацию о возникновении и развитии английского языка. Слайды презентации дают возможность познакомить учащихся с историческими событиями, происходившими на территории Британских островов с древнейших времен до наших дней, и помогают проследить влияние всех завоеваний на формирование британской нации и развитие английского языка.